With a strong commitment to safety innovation, JSP’s Research and Development team have designed a new range of Sonis® Ear Defenders which peaks at an unbeaten SNR of 37. Developed in partnership with a leading research facility in the field of acoustic engineering, this new range meets the needs of an extensive range of industrial applications. 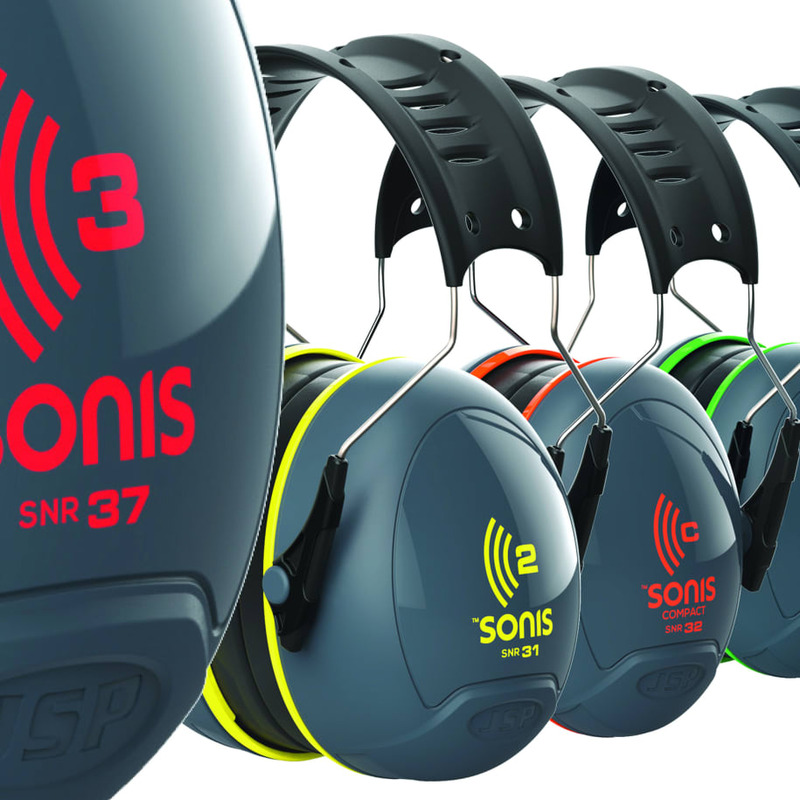 This exceptional range of Sonis® Ear Defenders is Kitemarked and meets EN352-1. The advantages of this range is that it offers a wide spread of attenuation with SNR values between 27 and 37 meaning that selecting the right model to match the wearers requirements is really straightforward. The Sonis® range has been stylishly designed with a traffic light colour code for easy identification and selection. The range moves from the green Sonis® 1 for low level noise to the yellow Sonis® 2 and the orange Sonis® Compact for substantial Industrial noise through to the market leading SNR of 37 for the red Sonis® 3 to protect against extreme industrial noise. The over moulded headband has a built in comfort area with ventilation to help reduce heat build- up. The headband force and the sealing ring surface area work together to provide optimum cushion pressure and therefore comfort, ensuring a good fit every time, delivering an ear defender which is a pleasure to wear. Manufactured in Oxfordshire, the Sonis® cups can be coloured to meet a corporate identity and can also be printed with a company logo for improved brand recognition and to prevent theft. JSP have invested in specialist acoustic and hearing test equipment to develop the Sonis® range in-house, and refine each individual component. The materials have been chosen for both performance and comfort for extended periods of use. The headband is manufactured from TPE so is easy to wipe clean, there is no adhesive or welded parts, so they can be easily disassembled to replace hygiene kits which are available for each model.